The second of five flying Me262s from the Me262 Project in Everett, WA has completed the FAA flight test program without incident. Known as Tango Tango, the Me262 (which can be converted from a single seat fighter to a two-seat variant) is now being prepared for shipment to its new owner near Munich, Germany. Test pilot Wolf Czaia reported that the testing was incredibly smooth, especially after recently completing the same flight test program in the first flying Me262, known as White One. 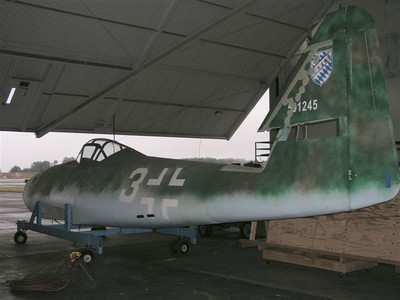 Work continues on the third flying example of the Me262 which is available for sale. Congratulations to Bob Hammer and the team Legend Flyers who have put in an enormous amount of effort to see another legend fly.